For over three decades students in Los Angeles and around the world have sought Gurmukh’s classes in Kundalini Yoga, meditation, and pre- and post-natal care. She is a co-founder, along with Gurutej Kaur, and director of Golden Bridge Yoga Center in Los Angeles, the region’s premier center for Kundalini Yoga and meditation. She teaches classes there and around the world. Gurmukh is also author of a number of books and instructional DVDs. She is well known for her range of instructional Kundalini Yoga Books and DVDs. Her book, The Eight Human Talents, has been a long time best seller. Recently she has produced a number of Kundalini Yoga DVDs jointly with Snatam Kaur – Healthy Body Fearless Spirit, Circulation and Detox and Strong Nervous System. Gurmukh is also a founding member of the Khalsa Way, an organization created with the aim of not only offering Kundalini Yoga but also helping people to deliver and bring up healthy children, as well as to find success in their careers and relationships. Her book, Bountiful, Beautiful, Blissful, explores the natural power of pregnancy and birth using Kundalini Yoga and Meditation. Her pregnancy DVD covering exercises for Pre-Natal Yoga, has featured in numerous publications such as Vogue, Elle, InStyle, the New York Times, and her appearances on Good Morning America have introduced Gurmukh to a much wider audience, and introduced them to the vast, ancient teachings of this wonderful yogic tradition. 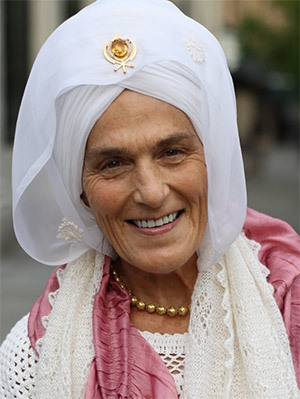 Yogi Bhajan baptized her with the Sikh spiritual name meaning "One who helps people across the world ocean," Gurmukh has dedicated her life to living up to that responsibility. She has been married since 1982 to Gurushabd Singh Khalsa. Their daughter Wahe Guru Kaur attended school in India, where Gurmukh returns frequently to teach and study. Below you will find our selection of products by Gurmukh. Enjoy our low prices and FREE US Shipping.